Gold as we all know, is a much valued metal known for its ornamental charm and aesthetic value. Being rare in nature it is hold over our minds as enigmatic. Since Time immemorial it is being used by our ancient system of medicine ‘Ayurved’. Skin is the most visible exposed organ of our body and is subjected to pollution, taxins, seasonal changes etc. It is also the most nutrition deficient organ in the whole body. 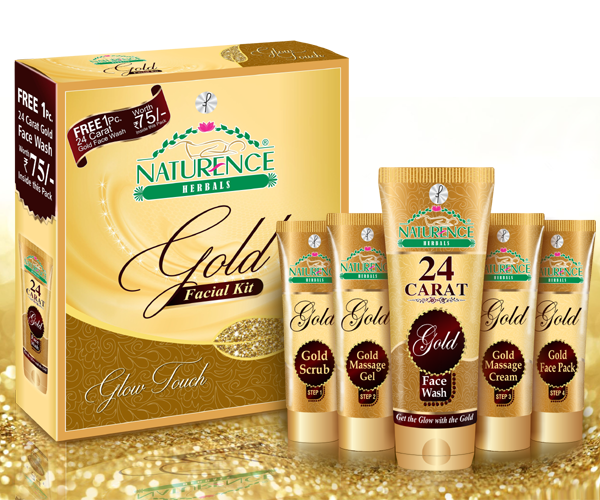 Gold being an easily absorbed metal flushed the skin of toxins and accelerates the regeneration of healthy new cells and in turn makes the skin more resilient and youthful. 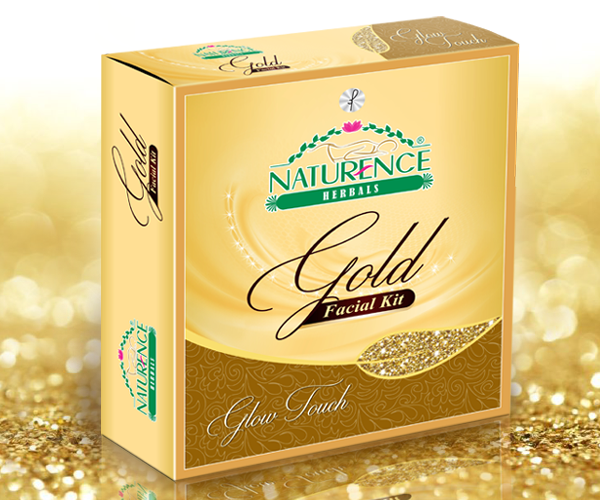 Gold Kit-this exclusive kit recharge our skin cells and help them rejuvenate and giving them stimulation of blood lymph and cell metabolism, which can help a dull, dry, sluggish skin glow like baby skin. It is mild purifying gel cleanser that removes surface contamination and dull impurities. Directions: Take amount required, massage the gel in circular movements for 2 to 3 minutes then wipe off with wet cotton. A double action scrub which not only removes dead skin, but also is smooth in texture to maintain the skin quality. Containing aloevera and witch hazel to tone up the skin. Directions: Apply quantity required, massage for a few minutes in circular movements then rinse off with luke warm water. An exclusive gold gel containing the right mix with lavender oil, wheat germ oil help to give instant glow to the skin, and tone simultaneously. Directions: Apply from neck to face massage for 5 to 6 minutes for better results, after massage do not wipe of the gel directly, apply massage cream and continue gold pack. This rich gold cream containing beach bud, which improves skin’s oxygen consumption, containing to a smoother, more radiant Complexion. Directions: Apply the gold cream on top of the gold gel and massage for 15 to 20 minutes to get extra glow and nourishment to the skin. A rejuvenating face pack with Gentian and Birch with the touch of Gold helps to improve dull dry and sluggish skin. Directions: Apply the pack from neck to face keep till semi dry, then gently massage for 2-3 minutes splashing some water to make smooth texture, rinse off with warm water. A moisturizer according to your skin can be applied after the whole treatment.